Having kids brings so much into a life. Where there once was solid sleep, now there are maybe 4 uninterrupted hours a week night. Where there once was the freedom to, say, run out with my dude for tacos & beer, or perhaps to use whatever language I pleased (however unbecoming), there are now a host of restrictions. BUT, as any parent knows, there is an even greater bounty of blessings. Some of the greatest blessings my daughter has brought me - and still does - are friendships, some of which I've talked about on this blog. When you're a full time parent, you tend to meet people through your kids' activities and schools and that's so great because not only do I find connections, but Lulu finds playmates and everyone is happy! One of the sweetest gifts Lulu has given me is my friendship with Stacy. Yes, I have mentioned her before (hint, she loves date bars) and, yes, I will most likely mention her again (and again and again! ), but my friendship with Stacy is worth talking about. As my first real mommy friend, she and I have been through all our parenting (and life) highs and lows together. So, when she tells me she's coming all the way to Solana Beach from Los Angeles to see me, I pull out all the stops. After a full day of sun and fun Saturday, we were all relaxed and renewed for Sunday morning breakfast at our house. We decided to keep it fuss-free which meant, of course, that I would take a special after-dinner trip to Whole Foods for fresh OJ, stay up late Saturday night making granola and wake up Sunday morning around 6am to start a yeast dough for cinnamon rolls. Simple, schmimple, this is my friend we're talking about! With the menfolk and the 2 babes, we numbered 6, so, I opted to make one batch rather than overdo it. Referencing my Tassajara Bread Book (which my good friend Wendy Mazursky introduced me to half a lifetime ago), I made the Yeasted Breakfast Bread dough (adding a little more sugar, as noted below) and spreading a very simple butter/brown sugar/cinnamon filling before rolling up and baking. Naturally, we had to have a cream cheese icing: I referenced a family recipe there and spread the goodness atop. Oh, my. These are soft, chewy, cinnamony-sweet and taste of home. Plus, as Stacy commented walking through my door Sunday morning, "it smells incredible!" 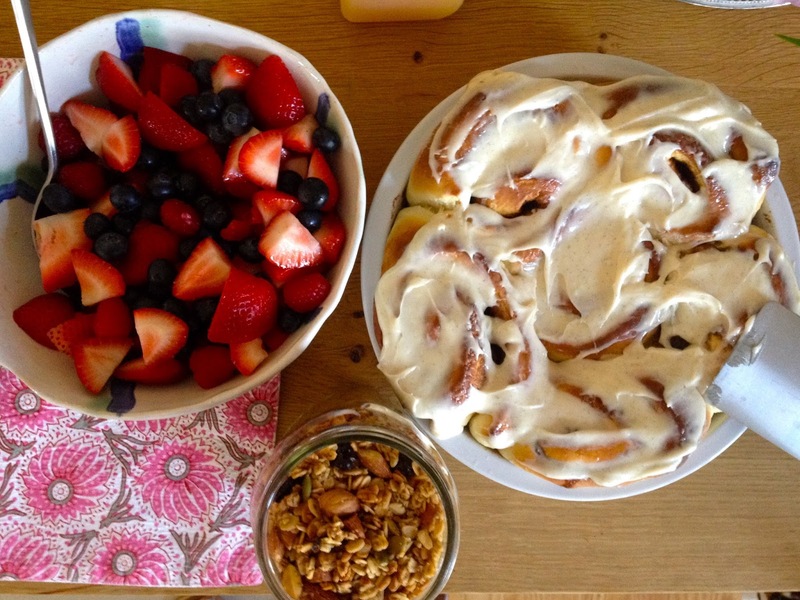 Cinnamon rolls are simple, really. It's just about putting in the time to let the dough rise a few times, but the rest of the work is pretty easy. And they do dazzle. In fact, there was not a crumb left over. Next time, to hell with not overdoing it. I'm doubling this recipe so we can eat them at tea time, dessert and breakfast the next day, too. If I'm hoping the promise of afternoon seconds will make my friends stay longer, you can't blame a girl for trying. After breakfast, we had to say goodbye, bellies and hearts full. But Monday morning, Stacy and I were already planning our next weekend together because, with true friends, it's never enough! Dissolve the yeast in the water. Stir in sugar and dried buttermilk. Stir in the egg. Stir in 1-1/2 C flour until a thick batter forms and then beat with a wooden spoon 100 strokes. Cover with a damp (not wet) kitchen towel and let rise for 30 minutes. While that's rising, make the cinnamon filling. Stir the butter, sugar and cinnamon together until they make a paste. Cover and set aside. Fold in the melted butter and salt (be gentle with the batter at this point. Fold, don't stir or beat). Then, fold in 1 C additional flour until the dough comes away from the sides of the bowl. If you need more in order for the dough to pull away from the sides of the bowl, add in the other 1/2 C.
Knead the dough on a floured board 5-10 minutes until the dough is smooth and does not tear easily. Oil the bowl by drizzling about 1 T oil and spreading it with your fingers to coat the sides. Place the kneaded dough back into the oiled bowl and let rise another 40 minutes. Meanwhile, make the icing. Blend the cream cheese and butter together to combine. Add the sugar and beat until soft and all the sugar bumps are gone, about 2 minutes. Add the vanilla and beat until blended. Cover and set aside. Once the dough has finished it's second rising, preheat the oven to 375. 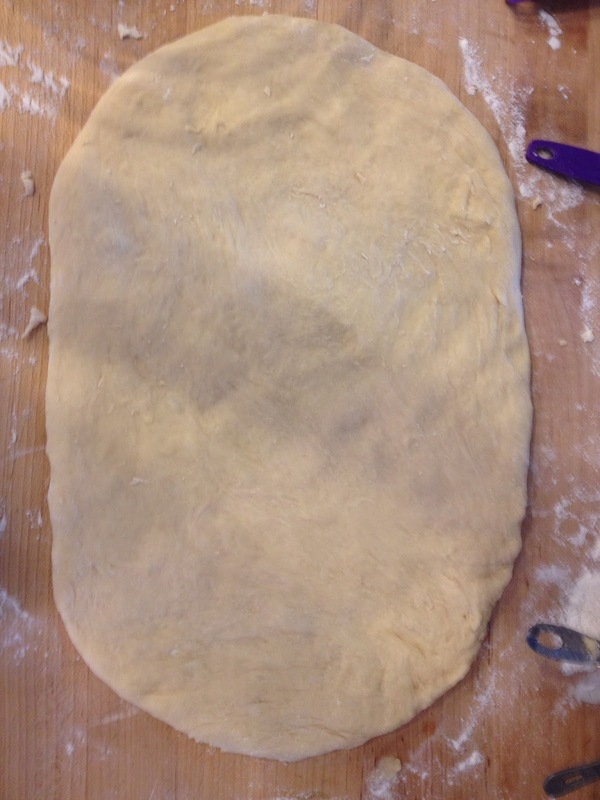 Roll the dough into a long, flat rectangle. Spread on the cinnamon sugar mixture, covering everything except 1/2" along the long edge. Tightly roll the dough beginning at the cinnamon-sugared edge and ending at the 1/2" you left un-sugared. Cut the roll into 6 even rolls, about 2-1/2" wide each and place into a pie or round baking dish. 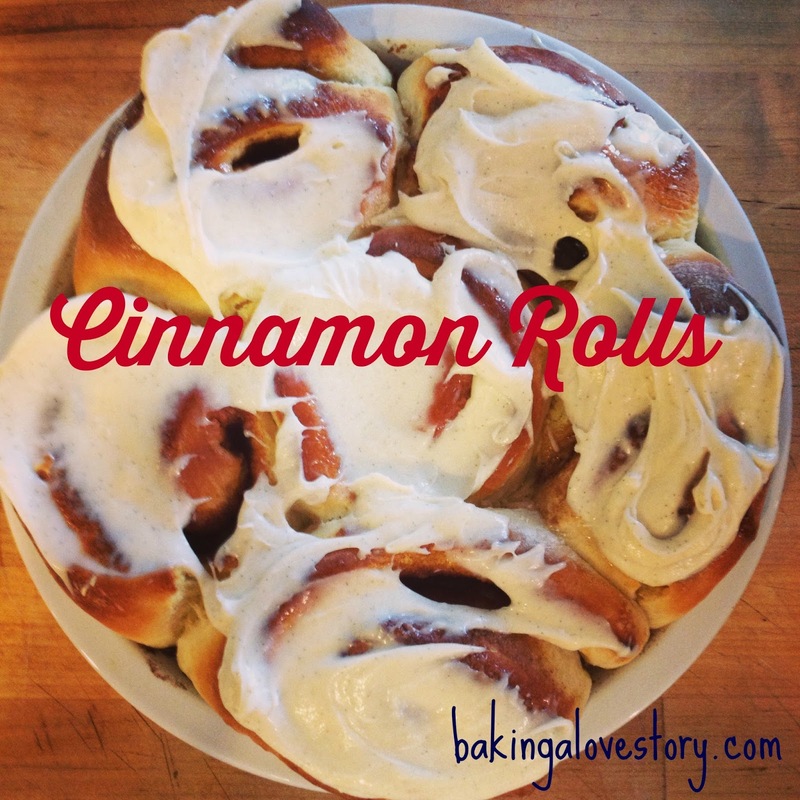 Bake at 375 for 20 minutes or until the tops are browned and the cinnamon sugar is bubbly inside the rolls. Remove from the oven and let cool about 20-30 minutes (not all the way, but if you spread the icing too soon, it just melts). Spread on the cream cheese icing and serve. 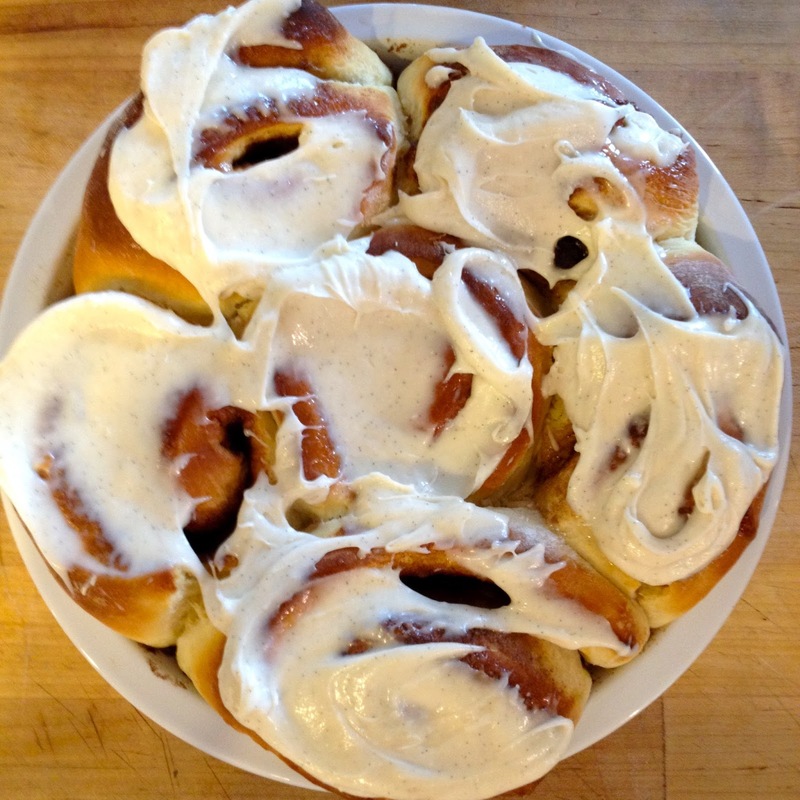 I've never made cinnamon rolls, actually one time I did, I made pumpkin cinnamon rolls, and I think they would have been good except I used self rising flour, which i was NOT supposed to use and the texture was all weird. And then I never tried again! But you have INSPIRED me to TRY. beautiful! These look so amazing! 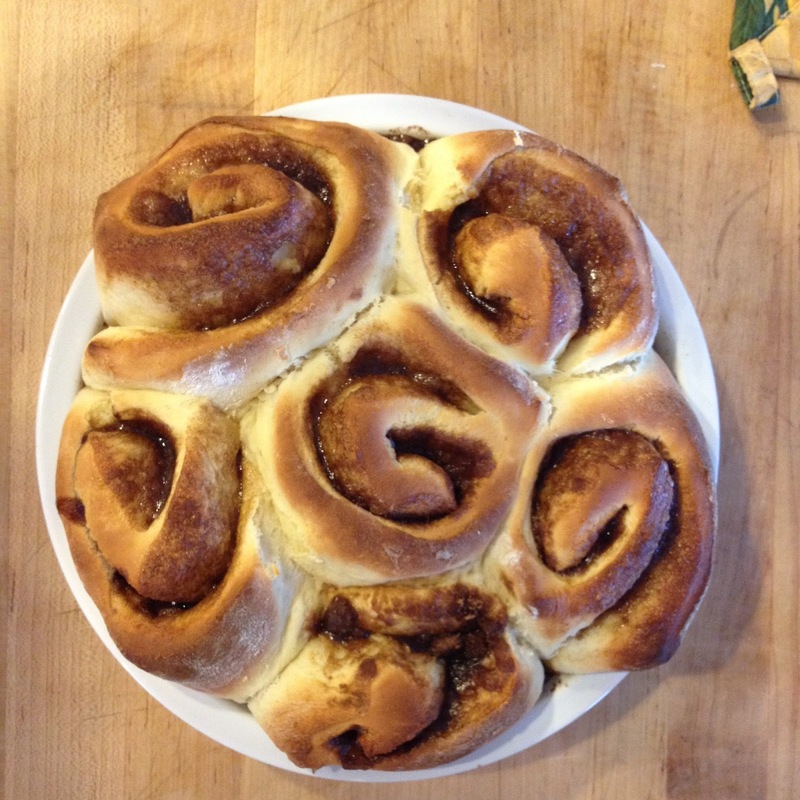 It has been years since I have made cinnamon rolls, so maybe I should try again.